Our behind the scenes interviews continue! Gary Gerani has done it all - he's written trading cards for Topps (Wacky Packages, Star Wars, Dinosaurs Attack! ), screenplays including the cult classic Pumpkinhead, and the groundbreaking volume on sci-fi/fantasy/horror on the small screen, Fantastic Television. His latest book, Top 100 Horror Movies, will be out next month from IDW. 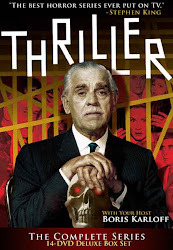 As a producer for the special features on the Thriller DVD set, we were honored to have him sit down to discuss the project with us. JS: Obviously you were writing about Thriller as early as 1977 for your book Fantastic Television. How far back do you and the show go? JS: That sounds a heck of a lot more appealing than starting things off with the first episodes broadcast! How did you come to be involved with the DVD release? GG: My close friend, Steve Mitchell, had been drawn into the world of producing special features for DVDs, and he put together the COMBAT! extras for Image a few years ago. But while COMBAT! was one of his favorite series, he had seen maybe one or two episodes of Thriller in his lifetime, and was anything but an expert. So he called me and said, "Looks like Image is going to do Thriller, and we'd like to produce some special features." So I think at that moment Image realized they needed a Thriller expert on the team, and I was delighted to jump in. Steve is great with his interviews, so while he was pursuing the Ted Posts and Arthur Hillers, I was rounding up the David J. Schows and Marc Zicrees... published TV historians/scholars who really know their stuff. JS: Based on the results, I'd say you both did a damn fine job assembling a roll call of contributors. Now that it's out - does the set live up to what you had originally envisioned? Was there anything you wanted to do that the project schedule/budget precluded? GG: It would have been nice to have done some kind of featurette, but Image didn't have the money or time for that. Although, honestly, DVD featurettes are often "sound bite" overviews for civilians — our commentaries dig much deeper. So ultimately, I feel what we dished up served the fan quite well. Certainly it would have been nice to have all the trailers and bumpers, and all the isolated music tracks. But what we did include was pretty impressive, given the non-existence of some of this material otherwise. And our still galleries rival anything Universal or NBC ever had. JS: We've been listening to the commentaries as we go; the sheer number for a show of this length is unprecedented, particularly when you consider how many different players are involved. It must have been a challenge determining not only which episodes would get commentary tracks, but who would do them. GG: When we first started, we only had a few weeks to complete whatever we intended to do. Stephen King was supposed to do the "Pigeons from Hell" commentary, but I suspected that might be a dream-wish, so I swiftly recorded a track as a back-up. Then we were given an extra month, which was great for a plethora of first-rate historians we brought in to do commentaries, and the interviews we managed to get with Thriller survivors. Actress Gina Gillespie's comments were actually secured by author/film historian Lucy Chase Williams, who transmitted them in her commentary track. PE: After working our way through the early (let's just say lesser) crime shows, we realized that in some cases, they're just as memorable, and potentially just as ripe for commentary, as their superior counterparts. GG: While most fans have contempt for the crime shows (Tom Weaver still thinks our set should have been horror only), I felt it was a good idea to include everything, both seasons at once. A few of those mystery shows were rather good ("Late Date" is often mentioned), and we're still talking about some pretty amazing Jerry Goldsmith scores, if nothing else. JS: You definitely made the right choice. And we both know that had you left any episodes out, (even "Mark of the Hand") those same fans would have been at you with pitchforks like angry villagers storming castle Frankenstein. Before we let you go, we put together a quick questionnaire for all of our interview subjects (James Lipton-style, with apologies to Bernard Pivot). GG: "Pigeons from Hell" ("The Cheaters" is a close Number Two). 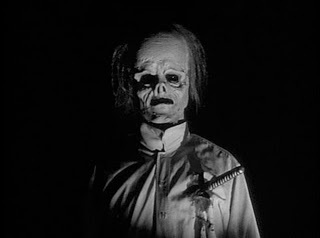 GG: They used classic studio movie-making techniques to convey classic, Weird Tales-type horror. GG: Occasional padding, the bane of many early '60s b/w melodramas. JS: What single word best describes Thriller for you? GG: "Rose's Last Summer". 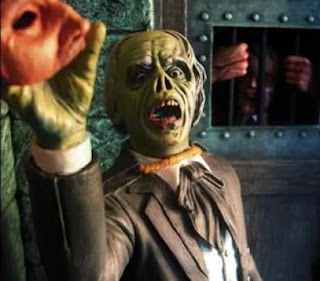 If they want to torture their victims with eternal boredom; "The Devil's Ticket", just to remind them of who's in charge. JS: Thanks Gary! Fans will want to be sure to check out Gary's commentaries on "The Prediction", "The Cheaters", "The Hungry Glass", "Well of Doom", "Trio For Terror", "Mr. George", "Pigeons From Hell", "The Grim Reaper", "The Weird Tailor", "The Return of Andrew Bentley", "Waxworks", "La Strega", "The Hollow Watcher", and "The Incredible Doktor Markesan"! 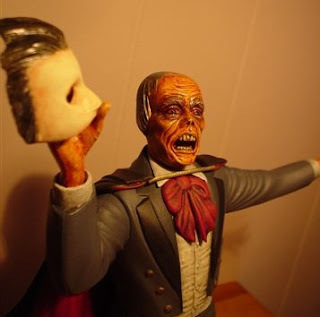 GG: Here are those two Phantom of the Opera Aurora kits, with the newly-sculpted Thousand Faces head looking more like Thriller's Ghost than ever! The new Phantom based on the James Bama box art. As a reminder - this is our second post of the day. Be sure to check out our review of "The Prediction." Also, if you missed our first behind the scenes interview with DVD Special Features Producer Steve Mitchell, you can read that here. I bought Gary Gerani's FANTASTIC TELEVISION back in the late 1970's before I even had a VCR video machine. Frankly, I never dreamed that someday I would be able to build up my own library of video tapes and dvds of my favorite TV shows. The book was an early groundbreaking survey of some of the important SF and fantastic TV series. I look forward to listening to his other commentaries on the Thriller horror episodes.